I've never liked planning birthday parties for the kids, but I do it because my sister makes me feel guilty. (Shay - you know it's true!). This year we were able to skirt the birthday party in exchange for a back-to-back, double sleep-over, and a day of adventures. We started the second day, Saturday morning, her actual birthday, with presents. Elle was very excited about the waffle iron, something she's wanted for a couple of years. Luckily a friend of ours was in the big city, Guatemala City, recently and he was able to acquire this for us. Yes, living in a small town with limited purchasing options means we have to think ahead. Elle's new waffle iron and a birthday card made with love by Tag. After an AWESOME waffle-heart filled meal, we headed to the nearby town of San Antonio Palopo, known for its pottery. The town is only 5 miles away, but it's not typical to take the local tuk tuks there. The best way to get between local towns is to take a pick-up truck. For 2 adults and 3 kids, it cost us Q20, about $2.50, one way. Worth every penny for the adventure! Man, this brought back memories of early childhood...you know the memories of riding in the back of the pick-up with dad drinking a beer as he's driving the family to the beach? Yes, that happened. And so did this, without the beer. Still others stand on the back bumper of the truck and hang on. We often turned around from our perch and found Tag standing on the floor of the bench and hanging over the side. Clearly he didn't appreciate his luck having a seat. Either way, he was safe...or safe enough. There was a lot less to see in San Antonio than I expected. It's a good thing we weren't hungry, because I don't think we could have found a satisfactory place for food. Even the market looked sketchy to me. The main drag in town separates the upper half from the lower half. It pretty much looks like this everywhere except behind us. The main church and market are directly behind us. They weren't much to look at, and we didn't even take a picture. Of course the view overlooking the lake is stunning as always. Pottery for sale on the street. Really? This is it? After spying some of the lesser-inspired pottery for sale on the streets, Ken relied on the advice from the travel books. Ken asked a local woman selling scarves where we could find the pottery factory. Then, Ken, our 2 kids, someone else's kid and I put our "Indiana Jones" on and followed this woman off the beaten path, around corners and through alleys until we reached it. Men sculpting and firing pottery somewhere in the middle of the alleys and homes of San Antonio. 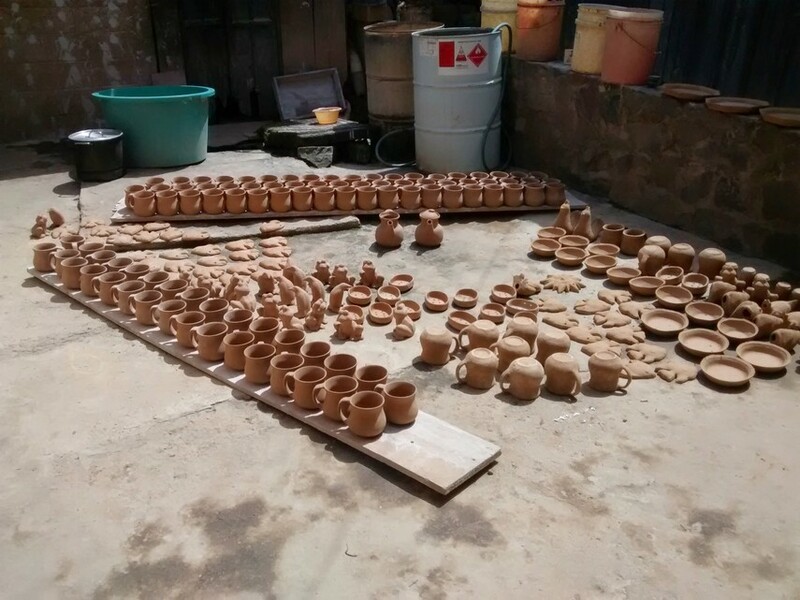 Pottery drying in the sun. Pottery for sale. It was tough deciding which piece was each person's favorite. Everyone picked out a special memento to celebrate the day. I must say, it's a real luxury drinking my morning tea out of a pretty ceramic mug instead of a cheap plastic one. Bowls for Tag (left) and Maya (right) and mugs for Ken (back left), Elle (back right) and me (back middle). We reversed our path, hopped on another pick-up and made it back to Panajachel around 2. The girls and I headed to a local hotel for appetizers and swimming. Many of the nearby hotels have an understanding with the locals -- As long as you buy drinks or food, you can swim in our pool. It's a great arrangement. We bought a movie on the way home from the pool and Elle's birthday was complete. We are so lucky to get to raise this child and be her parents. We love celebrating her life. She brings us much joy, and we love being with her.